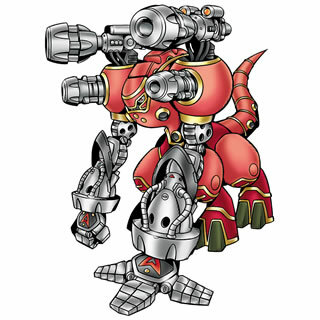 The Digimon Reference Book profile for December 18th, 2015, is Suijinmon. A translation is provided below; you may use it freely on forums, wikis, etc. so long as you link back to or cite this page. Profile: A Machine-type Digimon bearing Justimon and Mugendramon's parts. What motive there is for using these kinds of parts is unknown, but there's no mistaking that its combat power is high. Its special move is to crush its enemy with the power-type "Accel Arm" and use the same move as Mugendramon, "Mugen Cannon." The Digimon Reference Book is Bandai's official bible on the various Digimon species, first launched in 2007 and now comprising over seven hundred different Digimon out of the thousand-plus species that exist. It updates weekly with new Digimon profiles. Last week's profile was Blue Meramon.